Troy University’s first law fraternity, Phi Alpha Delta, has been chartered on campus with a pre-law chapter. The law fraternity was recognized at a chartering ceremony on Thursday, April 19, at Collegedale Church of Christ, where 31 students were initiated into the fraternity. 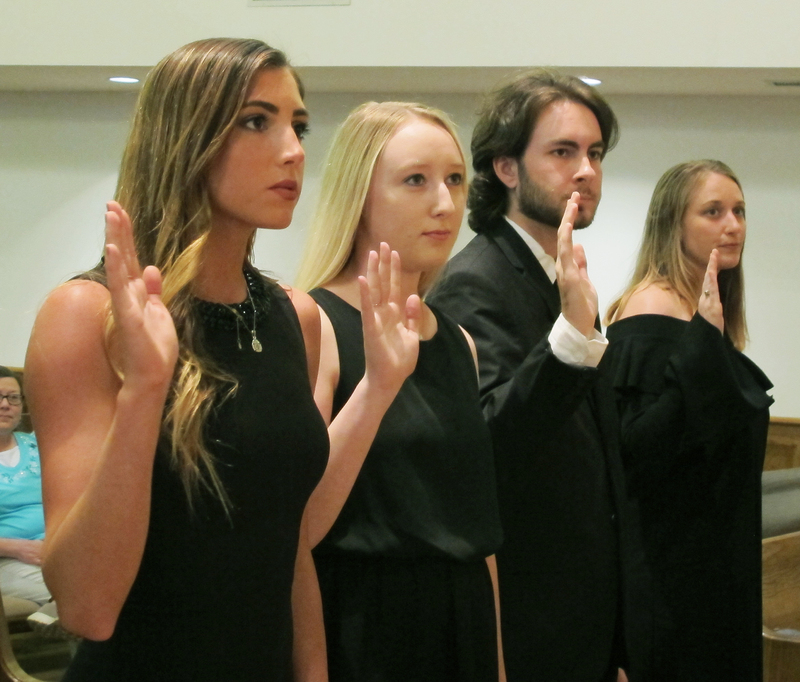 “Most lawyers are a part of it (Phi Alpha Delta), six Supreme Court judges were a part of it and we’ve had six (U.S.) presidents that were a part of it,” said Indiana Poret, a senior social science major from Nice, France, and vice president of Phi Alpha Delta. Poret said the pre-law society on campus initiated having a pre-law honors fraternity, and the process took four years to finalize a new law fraternity. “It’s a very hard process to do, to get a good reputation, because it’s a pre-law society,” she said. The fraternity has been getting bylaws approved and speakers in place for the remainder of the semester. On Wednesday, April 15, Virginia Nowling, a district judge candidate, spoke at the Phi Alpha Delta meeting. Nowling is a Republican candidate who told how she made a law school decision and the impact her legal career has had on her. The law fraternity will give students networking opportunities, connect them to professionals and prepare students to take the LSAT, according to Poret. “We’re going to have a lot of sessions with practicing, networking, learning about being a lawyer and all of the tips and tricks about the profession,” Poret said. According to Poret, membership from this chapter of Phi Alpha Delta can be transferred to another chapter in law school. “When you go into law school — like, most law schools have a chapter (of Phi Alpha Delta) — you can transfer your pre-law student’s fee to a real membership,” Poret said. Every other Wednesday, the law fraternity will meet at 5 p.m. in Bibb Graves 153, and the fraternity will be hosting speakers. “If you want to be a lawyer, or if you want to be, like, in the legal field, this is the place to join,” Poret said.